Sometimes I get excited when I buy a new toothbrush. However, that excitement is often very short-lived. 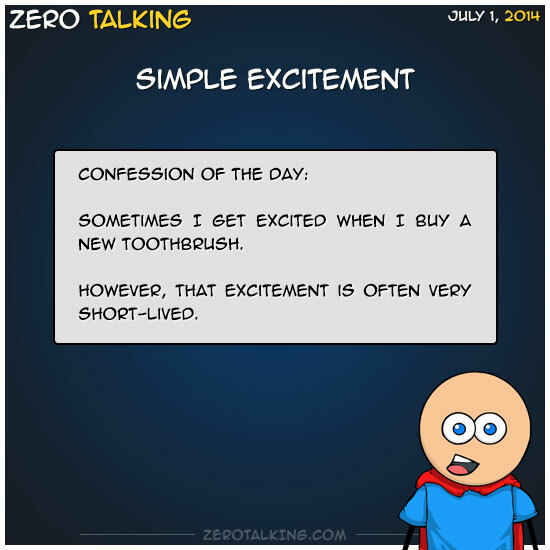 What silly or simple things do you get excited about? Melinda: I’m afraid that if I admit this, I will completely confirm what a nerd I am… but here goes: When I’m walking out of the library with a stack of novels, I get SO excited to start reading them. The most delicious part is when I sit down and choose which one to start first. Zero: Oh man, that strikes a chord, Melinda. They’re like free presents! Zero Another good one, Carleen. Fruit or not, I love growing healthy plants! Dawn: Books. New ones, used ones, doesn’t matter. Getting books excites me without fail! Oh, and shoes. And purses. Clothes, also. But books are always at the top of the Happy List!